Have you seen this symbol and wondered what it was? Well, this post is for you. 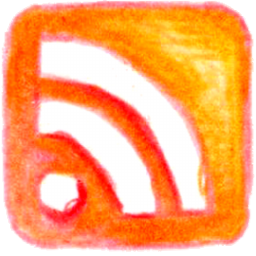 This symbol is for the RSS feed. What does this magical thing do? Well, it allows you to make a collection of the blogs that you want to read. There are several softwares out there that will keep track of the feeds you want to read. Personally I use Google Reader, but there are FeedDemon and RssReader as well. As you know, I’m all about workflow and streamlining my daily tasks. This is one of the ways I can save a lot of time by using a reader. Here’s a quick guide on how to set-up Google Reader. 1. If you don’t have a Google account, sign up. 2. When you’re on a blog that you would like to subscribe click on the rss icon (sometimes they make it easy for you and put it with their other social icons). If you can’t easily find it will be in the address bar (the blank space you type the web address). *If you are using Google Chrome, you need to install the RSS Subscription Extension. 3. Then that will take you to a page for you to select to add to your reader, click add to Google Reader. 4. Once you get into the reader screen you will need to click subscribe. That’s it, now you can see all the blogs you want to read in one screen. If you’re wondering what I read, I’ve now created a page that shows the blogs I read. If you’re using a Droid, iOS (iphone, iPad, iPod), or WebOS you can find an app that will pick up your Google reader subscriptions so you can read your posts on the go. Or like, me I read mine in bed at night, like one would read a book.